The Chicago Tool Library will launch a crowdfunding campaign Wednesday with a goal of raising $25,000 to outfit the organization's new space in the Chicago Sustainable Manufacturing Center. Funds will allow the Chicago Tool Library to purchase new tools, engage in outreach efforts, acquire tools and cover start-up expenses. The crowdfunding campaign launching this week is the culmination of more than a year of planning by co-founder Tessa Vierk, leveraging her background in the culinary arts, social justice, and sustainability. Co-founder Jim Benton helped run a tool lending library in Portland before moving to Chicago and joining the project. "We feel very confident about the need for a space like this. We are a city of makers and a tool library will ensure everyone has access to tools," Vierk said. "This will be a community institution built from the ground up with the donations, opinions, and hard work of people from all over the city." The Chicago Tool Library joins a global movement of lending libraries providing communities with access to tools and equipment. While tool lending libraries employ the basic lending structure of traditional book libraries, each one provides a unique offering of tools, equipment, education, and access to workspace that cater to the specific needs of its community. "If you believe in providing every Chicagoan with the equal opportunity to fix their bike, re-tile their bathroom, or build a garden we hope you'll feel inspired to donate to our campaign!," Vierk said. About The Chicago Tool Library: Founded in 2019, The Chicago Tool Library Co. is a non-profit organization and Chicago's first public tool lending library. The library's mission is to provide every Chicagoan with access to tools and the knowledge to use those tools to create, maintain, improve, and share. 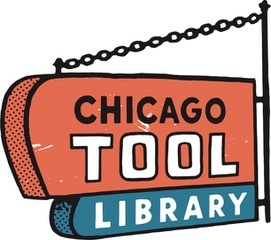 The Chicago Tool Library is located in the Bridgeport neighborhood of Chicago and will open to the public in July 2019.